The “China Through the Looking Glass” exhibition in the Metropolitan Museum of New York aims to capture Chinese aspects of art, fashion, and culture and appreciate it. It’s goal overall is to sell the idea that Western and Eastern art and fashion influence each other, but I argue that it is mostly the West orientalizing the East, specifically exotifying the most tangible qualities. Many of the art pieces are misrepresentations of Chinese culture and do not indicate appreciation for the real meanings behind the art, but just its unique qualities. This perfume bottle from the exhibit is an object that has aspects to contribute to the consumer orientalizing aspects of the West influencing the East. The exhibit titled its section “enigmatic spaces,” to contribute to the mystifying the Chinese culture, rather than attempting to understand it. The perfume bottle in this exhibit exemplifies the orientalizing of Chinese people and culture from the Western perspective from its name “Nuit de Chine” and fake Chinese writing, among other details. Les Parfums de Rosine (French 1911). “Nuit de Chine” perfume flacon. The photo shows an artistic display of a perfume bottle and the enigmatic space it takes up. The bottle is selling a scent, with red and purple accents. It is a memorable, unique shape. From this display, we can infer that the bottle is representing the repackaging of Chinese culture. Somehow, the brand of perfume is able to capture the “scent of China” and sell it. The Eastern manufactorers are able to produce and profit from the incorrect assumptions made from using a “Chinese” product. The makers of this perfume chose the colors red and purple, which symbolize exotic mystery, and relates China to this type of “other.” The perfume bottle shape and decorations allow one to exotify the Chinese culture incorrectly represented in this object. The product is called “Nuit de Chine,” which means “night in China” in French. The perfume bottle is from France, which only makes sense why the perfume’s name is in French. However, one must consider the meaning that the product somehow embodies the scent of a night in China. The perfume orientalizes the China lifestyle and culture, acting as if it is something one can acquire and wear. Westerners who are unfamiliar with Chinese culture may think the perfume is an accurate depiction of China, which diminishes the country’s value into a commodity. The Western perspective on this “Chinese” product and scent does not appreciate but devalues the Chinese culture. In addition to the title of the product, the perfume has some sort of characters on the bottle’s label. It is not distinctively Chinese, but it is the largest part of writing on the product. Due to the fact that the writing is not real Chinese, it is a huge indication of the lack of knowledge and respect for the Chinese culture in this product. The Western creators of the perfume bottle did not care to represent China in a correct way, but chose to create some kind of incorrect writing for the look of the product. Not only was fake Chinese writing incredibly disrespectful, it also allows the consumer to further orientalize Chinese culture by misrepresenting it. The consumer could ignorantly claim to know and understand Chinese culture, all because of the commodification of a fake representation of culture that the French company chose to portray. Overall, the representation of China and its people’s culture is belittling and disrespectful. Western influences turned meaningful aspects of China into an orientalized commodity that could easily be misinterpreted. 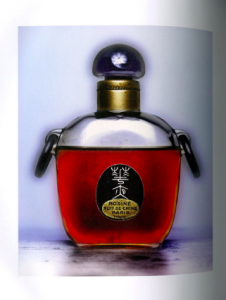 Rather than appreciating the true essence of Chinese culture, the French makers of “Nuit de Chine” essentialized race into a mysterious, exotic scent that could be misinterpreted in many ways. you have made a number of critical statements and supported with visual evidence. further tie the statement and evidence close and in detail. For the question of bottle form, for instance, how does the bottle reflect Orientalization? This entry was posted in Fashion and Gender in China, The Global - Orientalizing the Orient on April 26, 2016 by Rebkah Tesfamariam '18. The Metropolitan Museum of Art’s exhibition, China Through the Looking Glass sparked discussion regarding cultural appropriation, and orientalism. Many well-known and influential western fashion designers were featured in the exhibition. The curator of the exhibition, Andrew Bolton, was quoted as saying, “When you posit the East is authentic, and the West is unreal, there’s no dialogue to be had.” Although the Chinese culture is often misrepresented in the West as something very exotic and dramatized, the influence of the East inspired many Western and Eastern artists to create beautiful pieces of art for the exhibition. nice intro but any thesis statement that you’ll introduce? This blue and white evening dress designed by Roberto Cavalli (Italian born) that was displayed in the MET’s China Through the Looking Glass exhibition, was directly influenced by the iconic blue and white porcelain vases that are associated with Chinese culture, particularly the Ming Dynasty. Cavalli’s dress adds to the discussion of cultural representation, but does not do so insensitively. This dress is aesthetically beautiful. The shape of the dress adds to the elegance. White and blue are the two dominant colors. The shapes appear to be floral patterns. Only the bottom two thirds of the dress are visible in the image. The viewer only sees below the waistline to the floor. From the waist to halfway down the leg, the dress is very form fitting but then opens up and is loose and flowing around the feet. If the viewer knew nothing about this particular dress it would be easy to assume there were no cultural associations and it was just a beautiful dress. However, with background knowledge the viewer would know that this particular dress by Cavalli was a part of the China Through the Looking Glass exhibition. The Western designer found inspiration for the dress from Chinese vases from the Ming dynasty. When comparing the two objects side by side the shape of dress matches the shape of the vase, and the curvy body of a woman helps the dress to be shaped like a vase. 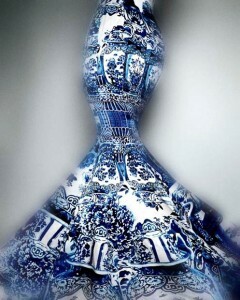 The colors of the dress were derived from the traditional blue and white colors of the porcelain vases. It is difficult to see all of the details that are a part of the designs on the dress, but at first glance the dress designs are very similar to some of the designs on the vases. The fact that the image is cutoff just above the waistline is more of an implication that the body has become the vase. It is hard to know how informed Cavalli is about the specific designs he used, which adds to the cultural discussion regarding . Although it is common for Westerners to take a piece of Chinese culture and misrepresent it in a negative way, I think Cavalli has simply added to the discussion between East and West in a decent manner. This entry was posted in The Global - Orientalizing the Orient on April 26, 2016 by laustin. In the exhibit, Empire of Signs, at the Metropolitan Museum of Art in New York City the impact of Chinese art, culture and general aesthetics on Western art and fashion was presented. The thesis was that Chinese aesthetics have driven “fashionable imagination” in Western countries for decades. In this exhibit, enigmatic objects, bodies and spaces were explored and shown to audiences. Enigmatic means: difficult to understand, mysterious. The items presented in the exhibit show this influence both as an enigmatic concept, and enigmatically. One of the categories of the exhibit Empire of Signs, was Enigmatic Objects. It is here the image of a bottle of perfume is seen. This bottle of perfume is from a french company founded in 1911. The fragrance is called “Nuit de Chine”, or Night in China/Chinese Night. For the reason that the perfume is called “Night in China” alone, it represents an enigmatic space. The bottle represented a capitalization of the appeal of mystery the Orient held for Europeans in the early 1900s. The scent symbolized for consumers the appeal of a location they might never visit, but that was “exotic” and shrouded in mystery. It would make them, the wearer, mysterious and exotic, desirable, out of reach. For researchers, the perfume symbolizes a location that is neither in the imagination of a French parfuemerier, nor in a busy Chinese city at night. It is both a location that is nowhere, and is in both places. This image itself is enigmatic as well. The perfume bottle has a label on it with what appears to be a false Chinese symbol. The label is meant to be uninterpretable, mysterious. It is not meant to be understood by users, nor taken seriously. The French words say the name of the brand, Rosine, and the name of the scent. The dark colored perfume, coupled with the simplistic brass handles on either end are intended to mimic popular European depictions of China. The entire bottle, its simplicity, its vague label, its name are all intended to promote an enigmatic space of China. the bottle, the label, and the scent created “enigmatic space of China”: the claim is appealing which calls for explanation/support, however. This entry was posted in Fashion and Gender in China, The Global - Orientalizing the Orient on April 25, 2016 by mzegarra. Anna May Wong was the first Chinese American actress to receive international fame. She is known for her countless movies, such as Shanghai Express and The Toll of the Sea. Wong is the focal point of this photo due to her fame as well as success. She is dressed beautifully and simply. The way she is standing in the photo causes the observer to wonder what she is doing and this also makes her more mysterious. Oriental woman as the focal point of the gaze! The term “enigmatic bodies” comes from the idea of being mysterious and difficult to understand. Within the nine photos we were assigned, each expressed this idea in some way. 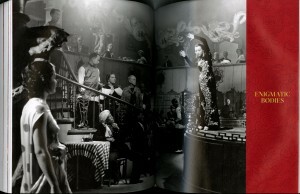 However, I believe this photo of Anna May Wong, from the film Limehouse Blues, captures the idea best. She is the focal point of everyones gaze. The world around her is solely focused on her. Due to this, it draws the observers eyes to her immediately as well. Something noteworthy about this photo is the fact that majority of the people in this restaurant are westerners. It makes Anna May seem like the object of their desires through their longing gazes. Also through these gazes it makes Wong appear much more mysterious. It makes the observer want to understand her and learn who this beautiful woman is right before their eyes. introduce the thesis at the beginning of the post and support the claim with elements of denotations: the setting, the costume, the lighting effects, and the audience …. Having the photo lack any type of color makes it mysterious as well. We are unable to know what the scene of this restaurant really looks like. However, I think that this pairs well with the enigmatic bodies due to its mysteriousness. The black and white is very simple, but leaves a greater impression on the viewer. The dragon was a common theme found in all our photos. Traditionally, the dragon represents power, strength and heroism among many others and has always been a symbol associated with China. Within all the photos given to my group, we noticed that a dragon appeared in each of them. Whether it was sewn into a garment or displayed in another way, the dragon is in every photo. In this photo, dragons are portrayed along the walls which emphasizes their importance. The dress Wong is wearing has very simple elements to it, but is done so intricately, making it very elegant. It also covers her completely, but still can be considering a revealing dress. Because it is tight and provocative it sexualizes Wong in some ways. The way this photo was taken, does not give us full view of the dress, but almost sends an elusion that Wong is the head of the dragon. The black background of the dress almost camouflages her and the gold is all we see. Having Wong physically become a “dragon lady” expresses her power and strength. introduce the idea of “dragon lady” at the beginning of the paragraph and then explain why Wong is configured as a dragon lady? This photo, to me, is still hard to completely understand. I think that was intended to be that way. I think this also goes along with enigmatic bodies as being mysterious and alluring. This photo is very attractive and interesting, but it is still hard to completely understand it. touched the notion of enigmatic bodies??? This entry was posted in The Global - Orientalizing the Orient on April 24, 2016 by mmsmall.